Ten Speed Press, 9781607747659, 256pp. Written by a celebrated floral designer and lavishly illustrated with full-color photography, this book provides step-by-step instructions for more than 45 stunning floral projects from simple to spectacular and equips you with the skills to customize arrangements at home. 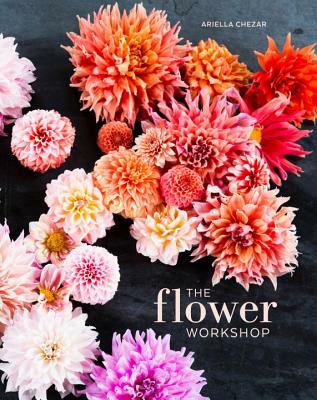 Whether hosting a party, helping out with a friend's wedding, or wishing to incorporate the beauty of flowers into everyday life, The Flower Workshop allows you to create dazzling arrangements that go beyond merely pretty and into realms of the dramatic, the unexpected, and sometimes even the magical. Known for her hands-on flower workshops at FlowerSchool New York, Ariella Chezar walks you through the nuts and bolts of creating a variety of small flourishes, tonal arrangements, branch arrangements, handheld bouquets, wreaths, garlands, grand gestures, and more—all accompanied by detailed photography. Chezar offers advice and philosophy on everything from texture and color to foliage and containers, providing an overall approach to living and working with flowers, with an eye toward fresh, local, wild, seasonally influenced floral design. For every occasion, from relaxed and simple to lavish and monumental, The Flower Workshop celebrates the special moments in your life with glorious, fragrant floral arrangements and enhances your surroundings with abundant beauty. ARIELLA CHEZAR is the author of Flowers for the Table and a master floral designer whose work has graced the covers and pages of Martha Stewart Living, O Magazine, Smitten, Sunset, Garden Design, Better Homes and Gardens, Domino, Real Simple, Sweet Paul, and many more. She is a teacher at FlowerSchool New York and has designed flower arrangements for the White House. Read more about her work at www.ariellaflowers.com. JULIE MICHAELS is a former editor for the Boston Globe and has written for the Wall Street Journal, the New York Times, and numerous magazines. "Offers practical guidelines alongside eye-pleasing color photographs....[An] essential flower-arranging guide." "Ariella Chezar is a true floral icon. In The Flower Workshop, we are inspired by her love of nature and her respect for the inherent beauty of botanicals in every season. Ariella generously teaches the craft of floristry and its essential techniques, and she shows students of this book that floral arranging is a means of personal and artistic expression." "These days it’s very fashionable for floral designers to grow their own blooms, forage for material, and create arrangements in a loose, organic style. But Ariella has been a master of this style for decades. An innovator rather than a follower, Ariella always creates floral designs that surprise and delight." "Ariella has developed a new vocabulary of floral design, one based almost entirely on the natural gesture of a plant and the way it grows in the garden. She’s inspired me (and a whole school of floral design) to avoid rigid perfection, and to rely more on cultivating an artist’s intimate eye on the world of flowers." "I am constantly inspired by the beauty of Ariella’s organic, creative, and thoughtful designs. Her arrangements have a sense of elegance and a natural aesthetic. Ariella’s touch is subtle, yet always innovative, and the artistry of her work is stunning without fail." "I recommend The Flower Workshop...Chezar, whose creations have an easy sweetness, is an accomplished designer who can count the White House as a client. She likes to work, she says, quoting the poet Mary Oliver, until 'I can hear the almost unhearable sound of the roses singing.' Surely that's reason enough to go snipping."